System connection: 304 Stainless Steel. Diaphragm: Heavy-Duty Butyl Rubber NSF Drinking Water Require Material. Reverse Osmosis Water Storage & Delivery. Water production speed is really slow in Reverse Osmosis membranes, a storage tank is needed for preparing enough quantity water. RO tanks use stainless steel connection and patented leaking pSROTection, Diaphragm specially flow design for assuring water flow with a steady speed. For antirust, tanks are highly rust resistant durable baked epoxy coating finish. Tanks are proved by NSF 58 drinking water standards. Liters. 1.3 8-3/4” 5-1/2” 2.2 lb. Liters. 8.0 10-1/4” 8” 5 lb. Liters. 18.0 13.4” 11” 9 lb. Liters. 24.0 16-5/8” 11-1/2” 12 lb. Liters. 176 35-1/2” 22” 57.2 lb. Reverse Osmosis Water Storage & Delivery. Water production speed is really slow in Reverse Osmosis membranes, a storage tank is needed for preparing enough quantity water. 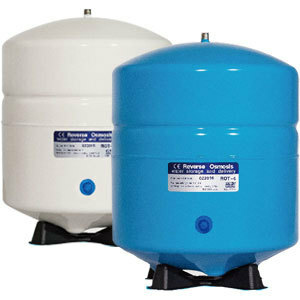 RO tanks use stainless steel connection and patented leaking protection, Diaphragm specially flow design for assuring water flow with a steady speed. For anti rust, tanks are highly rust resistant durable baked epoxy coating finish. Tanks are proved by NSF 58 drinking water standards. BDS Engineering is a producer, importer and exporter of Shyms reverse osmosis tank. Our 1995 established company in New Delhi makes use of 304 stainless steel, heavy-duty butyl rubber, FDA food grade polypropylene and other material in the production of this tank. This tank is necessary in water treatment systems for clean water storage. This tank features a heavy duty diaphragm and polypropylene liner design. Customers can be assured of zero smell of rubber or plastic. Our company offers this ready to install and use Shyms RO tank. Customers can ask for more sizes of this tank and we can make them available. This completely enclosed tank ensures that drinking water doesn't comes in contact with metal. The quality and safety of this tank are assured as it is made as per standards, like NSF Standard 058, IAPMO R&T UPC, and CE.